All Theme's here are made by US and 100% FREE just for our users ! we post a new theme from time to time for you guys to enjoy for free! 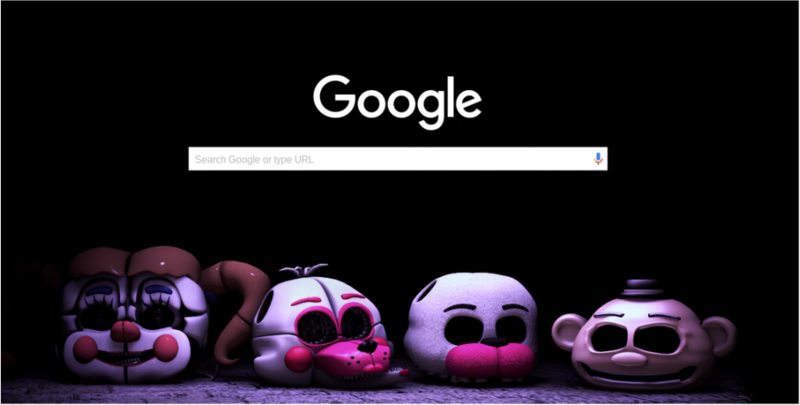 Here is a latest FNAF Sister Location theme! Enjoy the dark coloring with the cool mini aminatronic heads popping out of the toolbar! Download it now and enjoy! For those of you who don't know! We ran a competition where our users could download a particular Foxy image then design and colour him in! Our winner was Sara Hyuga, were featuring her image in our new theme! Enjoy! For those of you who don't know! We ran a competition where our users could download a particular Freddy image then design and colour him in! Our winner was Julia Irene Wonders, she won a Limited Edition Chrome Theme. But more importantly were featuring her image in our new theme! Enjoy! CLICK HERE TO DOWNLOAD THIS THEME FOR FREE! Enjoy this beautiful Luigi Chrome Theme. Download now and have the greatest green companion right on your chrome homepage! Sometimes its good to be bad Bowser chrome theme is EPIC! A very nice clean look on the homepage and well.. Bowser kinda rocks here! But don't tell Mario! "FIRST YOU GET THE MONEY"
"THEN YOU GET THE POWER"
"THEN YOU GET THE WOMAN"
any theme at all!! really we mean anything..